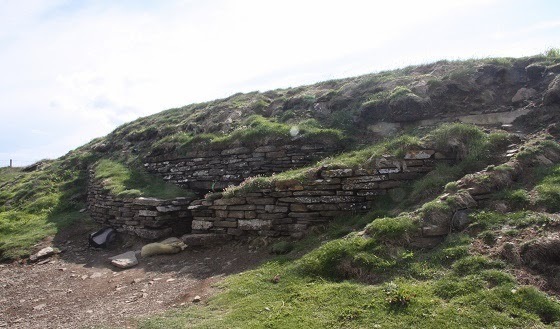 A few more photos from my holiday in Orkney - this time taken at the Tomb of the Eagles - and I am glad I visited the site before my camera broke. 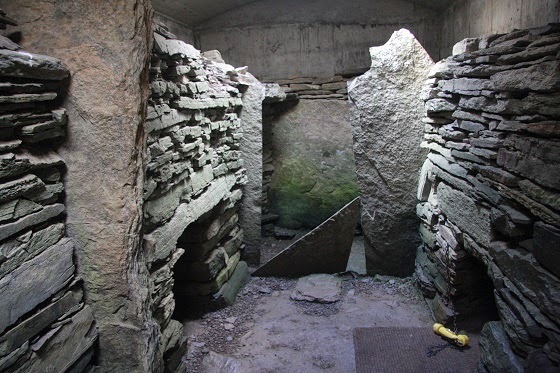 The Tomb of the Eagles is a Neolithic chambered tomb on the edge of a cliff at Isbister, in Orkney, Scotland. As well as being an impressive ancient site in a beautiful location with views out to sea, visitors to the Tomb of the Eagles actually get the opportunity to handle some of the items archaeologists have found there. 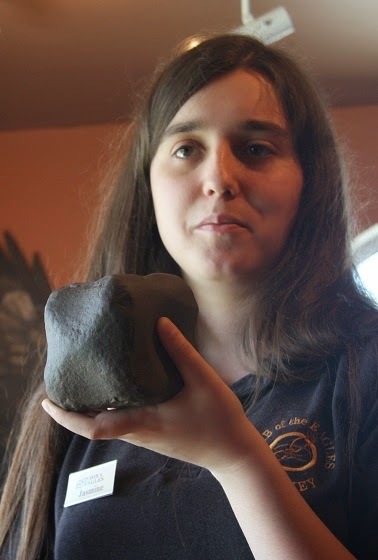 These include eagle talons that were discovered among the grave goods, stone tools, beads and the mysterious shaped rock you can see in the photo to the right, being held by one of the staff at the visitor centre. As many as 16,000 human bones belonging to between eight and 20 people were uncovered at the site, as well as remains from 725 birds, mainly white-tailed sea eagles. A curious fact I learnt at the excellent talk that is included with the entry price when you visit the tomb, is that some of the individuals laid to rest there had strangely mutated skulls. This may have been the result of inbreeding and would have meant they were blind and had oddly bulbous heads. Scary. The Tomb of the Eagles is a private archaeological site. It was first explored by Ronald Simison in 1958, who then conducted his own excavations there in 1976. Archaeologist John Hedges later did a full study and wrote the book Tomb of the Eagles: Window on Stone Age Tribal Britain, which gave the site its name. It has recently come out in Kindle edition.